Here is what is known about the Voynich manuscript, a mysterious document that has bedeviled scholars and top cryptographers for more than a century: It consists of 246 pages of handwritten script and illustrations. It was discovered in an Italian monastery by a Lithuanian bookseller named Wilfrid Voynich in 1912. Here is what is not known: Just about everything else. The greatest code breakers of the last 100 years have failed to decipher the Voynich manuscript’s ornate script, or even agree on whether it says anything at all. Experts have theorized that it was written in Europe, Asia, or South America; they have speculated that it was created by Leonardo da Vinci, by 13th-century philosopher Roger Bacon, or Wilfrid Voynich himself. When it comes to code breaking, “The Voynich is the Mount Everest of the genre and the K2 at the same time,” said Nick Pelling, a British computer programmer who wrote a 2006 book about the manuscript and maintains a website about historical cyphers. Today, the manuscript is kept at Yale University's Beinecke Rare Book and Manuscript Library, where, according to staff, it is one of the library’s most frequently requested objects. Now that the library has put high-resolution scans of the pages online, the Internet turns up almost limitless chatter about the manuscript, much of it crackpot. What is perhaps most striking about this unscalable peak, however, is how many different serious academic specialists have brought all the resources of their disciplines to try to climb it. Linguists have puzzled over the script, physicists have used computerized models to analyze its patterns, chemists have analyzed its parchment, and historians have traced its ownership through the centuries. Last month the Voynich landed in the news when a retired botanist and a retired Department of Defense information technologist proposed a new theory based in botany: Arthur Tucker and Rexford Talbert identified 37 of the manuscript’s 303 botanical illustrations as plants that could be found in a 16th-century botanical garden in central Mexico, and argued that the manuscript was written primarily in an extinct dialect of the Aztec language Nahuatl. Last week came another claim: Stephen Bax, a British applied linguist, announced he had translated 10 of its words. The fact that a botanist, an information technologist, and a linguist have published new theories on the manuscript within just a few weeks attests to the Voynich’s remarkable intellectual pull—and offers a fascinating illustration of what happens when you try to solve a puzzle with very different sets of tools. That’s true even if the puzzle turns out to have no real answer at all—if the Voynich manuscript is, as some suspect, a hoax or a pure curiosity, perhaps even created to build this kind of feverish interest without giving up its secrets. Either way, whether the Voynich’s ability to draw disparate scholars to a common mystery came about accidentally or deliberately, it’s hard to deny that it is devilishly good at its job. The Voynich offers more than just an uncrackable written code: Colorful illustrations depict fantastical plants, astronomical diagrams, and groups of naked women in bathtubs. You could embrace the book as a linguistic brainteaser, an antiquarian book novelty, a guide to a lost theory of the natural world, or a portfolio of outsider art. Based on information in the letter, Voynich suspected Roger Bacon was the author, which would have placed its origins in the 13th century. In 2009, however, scientists performed radiocarbon dating on scraps of the manuscript at the behest of a documentary film crew, and found that the bound collection of vellum pages dates back to the first half of the 15th century. This satisfied most so-called Voynichologists that it was not a later forgery—though not all of them, of course. Some say a 16th-century trickster could have bought a sheaf of old vellum in order to make his forgery look old. The most important contemporary question about the manuscript is whether its text is “real” or not. Broadly speaking, there are three possibilities: It was written in a so-far undiscovered language; it was written in a code corresponding to a known language; or it’s a hoax written in a gibberish fake language. Few serious Voynichologists these days believe the script is written in an undiscovered “real” language, because it does not obey the rules of any other known languages: For example, one particular character appears only in the first lines of paragraphs. Most attention has focused on the notion that the manuscript is a cypher for a known language. Pelling, for example, believes it’s most likely a 15th-century “encyphered book of secrets,” similar to the handbooks of magic and medicine that would become popular in Italy in the 16th century. Over the years, people have guessed that the manuscript is written in coded Chinese, Welsh, Hebrew, or German. Gordon Rugg, however, a respected British psychologist and computer scientist who wrote about the Voynich in his 2013 book, “Blind Spot: Why We Fail to See the Solution Right in Front of Us,” sees a case for the third possibility—and is not convinced by Montemurro and his coauthor’s findings. “They just say there are nonrandom parts, but everyone has known that,” Rugg said. “That’s been known for a long time.” In 2004, he published a bombshell paper in the journal Cryptologia claiming that the manuscript could be a hoax, a notion that had previously been dismissed because the text patterns were deemed too complicated to be faked. By using a table and grille—a simple chart of characters, and a paper with a rectangular hole cut out of it—Rugg was able to produce gibberish text that mimicked the complex, nonrandom patterns of a real language. Rugg’s prime suspect is Edward Kelley, a con artist in the circle of Queen Elizabeth I who is known to have created a language he called Enochian. But Kelley is far from the only possibility. Andreas Schinner, an Austrian theoretical physicist who published a 2007 paper supporting Rugg’s hoax theory, speculates that the manuscript could have been created as a strange work of art, a philosophical experiment, or that the author could be an “a ‘savant,’ an autistic monk, who subconsciously followed a strange mathematical algorithm in his head.” Others have proposed that the author could have been a mentally ill person, or a quack mystic who could attract customers by claiming to be the only person to interpret the mysterious manuscript. 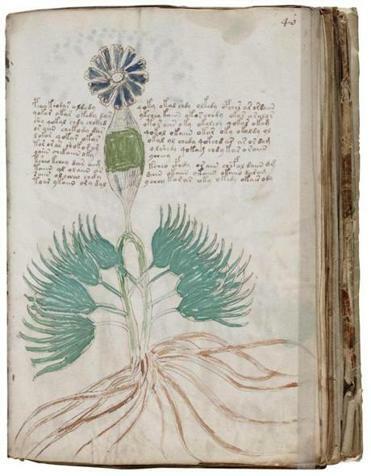 There has always been something slightly disreputable about studying the Voynich. Tucker and Talbert write in their new paper that studying it is considered “academic suicide.” Pelling goes farther, calling it “kryptonite.” As early as 1929, the historian Lynn Thorndike dismissed “occult” efforts to decipher the manuscript in favor of reading the volumes of historic scientific manuscript that are written in plain Latin. When Rugg published his paper in 2004, it was the first work on the subject to be published in a peer-reviewed journal in almost 50 years. This is partly because thoughtful studies of the manuscript necessarily draw from different fields. “If you publish in a journal, there are boundaries you’re supposed to observe,” Pelling said. “It’s difficult to find a journal that fits those boundaries when what you’re studying goes across the boundaries.” He sees the Voynich as an indictment of the way many academic disciplines have fragmented over the course of the last century into smaller and smaller expertises. Pelling believes the answer to the manuscript will come from the field of intellectual history, whose practitioners look at historical evidence from a big-picture perspective, rather than the small-bore analysis of, say, botanists and statisticians. As for Tucker and Talbert’s new paper proposing a Mexican Voynich, many of the world’s far-flung Voynich obsessives remain unimpressed. “The Tucker paper is just the same as so many other people’s Voynich theories,” Pelling said. Online, he blasted the authors’ “historical naivety and overhopeful botano-centricity.” Rugg is equally skeptical. “They didn’t do any of their homework,” he said. “It’s horribly easy to come up with an idea that looks plausible from within the confines of your own idea. But if you ignore the reasons that idea has been wiped off the board because of the ideas in another discipline, you’re going to end up looking unfortunate.” That is the major problem with the paper, many critics say: It only explains a small portion of the manuscript. 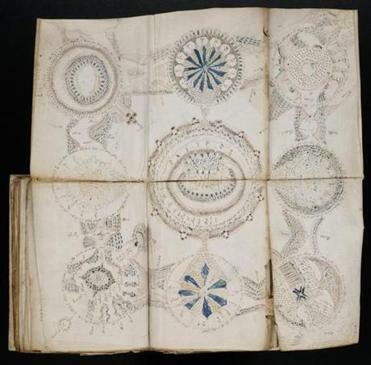 If the manuscript was crafted by a native Mexican, asks René Zandbergen, a German space engineer and proprietor of a respected Voynich website, then why does it include a European zodiac design? In this view, Tucker and Talbert fell into a familiar trap: They took the massively complicated manuscript, and extrapolated a sweeping conclusion from the sliver of clues that fit their hypothesis, while ignoring the many parts of the manuscript that don’t fit. Schinner compares it to the story of the blind men trying to describe an elephant, and who come up with vastly different hypotheses by feeling the trunk, the tusks, and the leg. “It is always bad scientific practice to totally ignore evidence contradicting [one’s] own position,” he wrote in an e-mail. Schinner’s comparison suggests something else, too: In a way, whether the Voynich is someone’s organic creation or a hoax is almost beside the point. It is either a natural-born elephant, or one specifically engineered to confound and delight the “blind men” who have been obsessed with it for more than a century. Either way, it has withstood an astonishing amount of intellectual firepower from many directions. And in a world of specialists working in their own silos, the simple fact that it has fostered so many cross-disciplinary conversations—not to mention so much fun—makes it valuable. Ruth Graham, a writer in New Hampshire, is a regular contributor to Ideas.